Prepare the pastry shells according to the package directions. Use the colored fruit strips to make hats and scarves to "dress" the cookies. For the eyes, roll bits of the fruit strips into balls. Spoon the pudding into the pastry shells. Top with the whipped topping and sprinkle with the green sugar. Refrigerate until serving time. 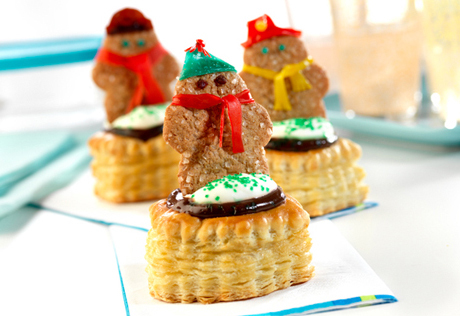 Press the decorated cookies into the filled pastry shells. Serve immediately.